The Swiss Science Center Technorama in Winterthur is one of the largest science centers in Europe. It offers more than 500 hands-on exhibits for 270,000 visitors a year to experience natural phenomena. Labs on chemistry, biology, and physics allow visitors to explore more complex issues and use the scientific method to answer questions. In the new chemistry lab workshop “Happy Hour on the ISS” the participants accept the challenge to find ways to recycle water aboard the International Space Station. Instead of expensive supply missions to provide the crew with fresh water from Earth, mission command (the lab supervisor) decided to recycle the drinking water on the station to reduce costs and increase the station’s autonomy. So the workshop starts with a beaker glass full of urine, which actually is, for hygienic reasons, artificial urine with components that resembles those of the real thing. The objective is to treat that urine so it will have drinking water quality again. After a discussion of the possible components, the analytical equipment, and the available purification methods, the teams treat urine with reverse osmosis, filtration, active charcoal, and distillation methods. After each step the sample is tested for smell, color, pH value, conductivity, and other parameters—and the results are discussed. Combining the methods and results of different groups, the participants try to find a good combination and sequence of methods to get drinking water again. Workshop participants learn what kind of water treatment is required to tackle a specific pollution or neutralize physical or chemical changes. Enclosed in the limited room of the space station, the finite nature of resources becomes obvious and the enormous effort, technical complexity, and energy we have to put into the wastewater purification raises awareness for taking care of the natural resources like water. 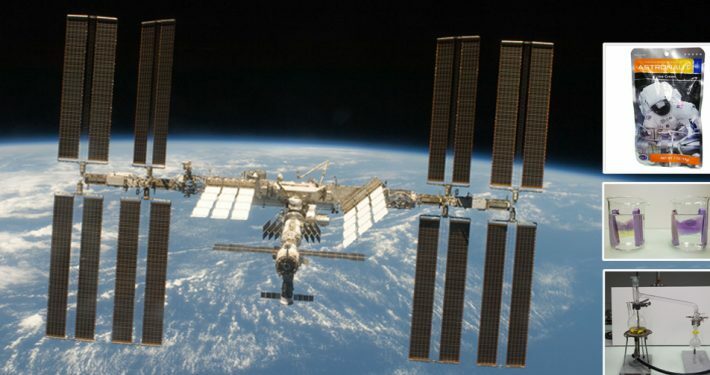 The ISS becomes an analogy to our Planet Earth.